Well. I certainly didn't expect to spend two hours in front of HBO tonight. I hate remakes as a general rule, and modern remakes of classics particularly annoy me. King Kong, anyone? Do we really need new versions of True Grit and Mildred Pierce? There are so many eminently adaptable novels out there that have never been filmed, and even ones that have, but were filmed badly the first time around. Why do we have to keep re-digging old ground? I probably wouldn't have bothered with HBO's all-newfangled Mildred Pierce at all if Kate Winslet wasn't involved. But I like her as an actress, and beyond that -- well. Let me slip briefly into full crass adolescent mode: I'd kiss that woman from the top of her head down to the tips of her toes and then work my way back, only slower. And that damned lucky stiff (pun intended) who gets to play Monty! Why don't I ever get work like that? I tell you now that if I did, I'd do everything in my power to blow every take, just to make it last. . .
Oh, yeah. Mildred Pierce. What's the point? In its favor, the producers haven't in any way tried to re-make the Joan Crawford version, but instead took took a completely different approach to the material. Within minutes, I was thinking "Dang, I'm going to have to break down and read the book now." By choosing not to open with the murder, the entire thrust of the thing is changed. 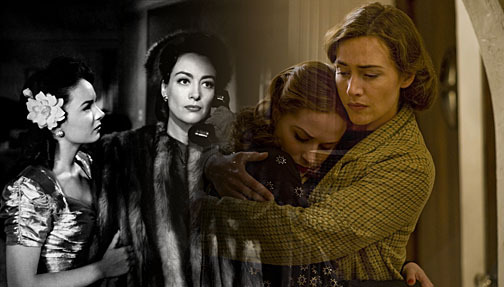 Mildred Pierce becomes more of a family drama than a noir, and unless you know what's coming you'd be justified in believing that the story was going to track in the direction of "a story of redemption and rebirth." That, of course, is exactly not where it's really headed. Very much not in its favor is the runtime. Mildred Pierce is a fairly slim book, and squeezing a five-hour mini-series out of the thing must be a lot like squeezing a gallon of juice out of a single orange. Not having read the book, I can't tell you where the padding has been inserted, but padded it very much is. At times, this Mildred Pierce has the arthritic pace of a daytime soap opera, and stringing together two parts in one sitting makes it all the worse. Events that took a few minutes in the original picture here seem to go on for days. I was able to get up and do the dishes without missing a thing. Honestly, five hours of Mildred Pierce is a lot like three hours of King Kong. It looks gorgeous, and I can watch Miss Winslet suffer through her trials until the cows come home, but honestly someone needs to take a pair of pinking shears to this thing. As Jerry Lewis wrote in his very entertaining book The Total Filmmaker, "How freakin' long can you drown Shelly Winters?" There are going to be people who try to tell you that this version is grittier and more realistic than the 1945 version. I'm going to tell you that it isn't so. With its calculatedly beautiful photography and design, and Miss Winslet doing things like letting her bathrobe drape over her bare shoulder in a way that must have been uncomfortable and that no person would stand for in private, this Mildred Pierce is no less glamorized or Hollywood-ized than the original version, It's just that glamour means a different thing than it did in 1945, and it's all right today if it comes with a little bit of tarnish and patina. Tarnish and patina are exactly what the director of photography gives us here. It's lovely to look at, but sometimes feels a bit calculated. The performances are tops, from Miss Winslet all the way to the crusty old coot playing the restaurant owner, and here, at least, the style is more naturalistic than in the original. But in the end, what kept me watching the new version was not so much its quality as my interest in how very different two films based on the same novel could be. The plot points are all there, but everything else -- it's a bit like looking at non-fraternal twins. There are eerie similarities, but no one would mistake one for the other.